Greetings friends and fellow crafters. LeeAnn here today with a project I made using "Your Next Stamp" products from White Rose Crafts. 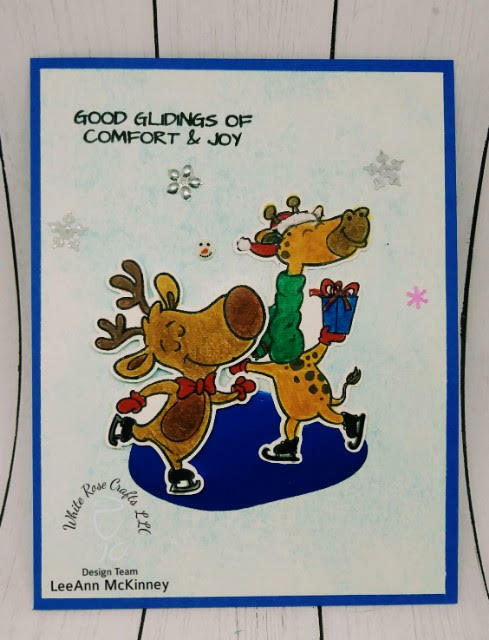 To make this project I used the Glad Glidings Stamp set which I colored with Chameleon Markers. I also used the "Skating Rink Scene" die set which I used double side tape and WOW brand Fab Foil in Turquoise. I used Tumbled Glass Distress Ink in the background to give it a slight color. My final touch was adding a few sequins from the "Frozen" Sparkle Blends mix. Use the code: YNS 10 in the store for 10% off the Your Next Stamp line of products.